Saw DingDong Dantes and Angel Locsin endorse a product? Then picture this, people! Sometimes in order to make sense of very large numbers and fully appreciate certain realities, it helps to come up with some kind of visual equivalent similar to what was done in the documentary movie Super Size Me where there’s a commonly sold serving size of softdrink that is so big it’s like downing a big jar of table sugar. According to Unilever’s vice president for corporate planning Chito Macapagal, 70% of Unilever Philippines 2007 sales is from the sachet market. That’s 70% of 30 billion pesos, or 21 billion pesos three years ago. That’s nine zeroes following 21. The company was enjoying double digit growth rate from the previous year, so expect that by now those numbers are now not just big, but big big. Can you picture how many sachets 21 billion pesos’ worth of Unilever products are? Well, let’s see. Which brands of theirs have sachet variants? Sunsilk, Creamsilk, Rexona, Clear, Knorr, Lady’s Choice, Close-Up, Best Foods, and Vaseline come to mind. If they ever have Selecta in sachets I’m gonna shoot myself, but I digress… Moving on, 21 billion pesos in sachets, if say, the average price for any given sachet were 20 pesos conservatively (I say conservatively because first, most of those mentioned cost less than 20 pesos, and second, 21 billion pesos in Unilever’s sales is at supplier-to-distributor prices, which are lower than retail), would be equivalent to 1,050 million sachets. If a given sachet has 10mL of product inside, it’s like they’re producing- no, selling at least one Olympic size swimming pool’s worth of product every 3 months. That doesn’t sound like much, but you could shampoo all 90 million Filipinos 20 times over with that much shampoo, if it were all shampoo. What’s difficult to imagine is the sheer quantity of packaging material that went into the making of all those sachets. If 1,050 million sachets were sold, then the waste would be 1,050 million multiplied twice to include front and back of the sachet, times 3 inches by 4 inches (I took an estimate of a Clear shampoo sachet), which equals 25,200 million square inches. This is the equivalent of about 16.26 square kilometers worth of sachet or wrapper material. 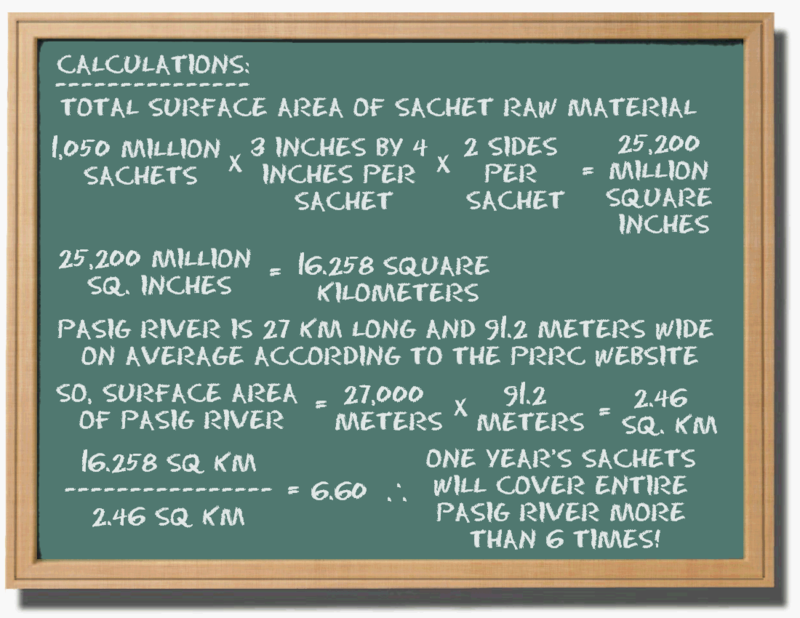 Now, before you do take the initiative to shoot me for driving you nuts with numbers, picture this: 16.26 square kilometers of sachet is enough to cover all of Ilog Pasig’s water surface area in non-biodegradable wrapper material more than 6 times over. Think it’s crazy? Unsure of the math? Try the numbers and see for yourself how much material is useful initially as product container, until such time it is thrown away and clogs drainage systems, pollutes rivers and other bodies of water, like Ilog Pasig. I’m not saying it all ends up there, but with how much we’re consuming of these sachet products, it takes just a small fraction of it all to cause so much damage to our environment. Think about that before letting DingDong and Angel get you to buy your next sachet. This entry was posted in Problems and tagged angel locsin, Best Foods, Clear, clear shampoo, Close-Up, Creamsilk, dingdong dantes, Knorr, Lady's Choice, pasig river, Rexona, sachet, selecta, Sunsilk, Vaseline. Bookmark the permalink. 1 Response to Saw DingDong Dantes and Angel Locsin endorse a product? Then picture this, people!